The Boekenhout Trail will take you 30 min to complete and is 0.65 km long. It is a short, but fairly steep, circular trail through forest. The trail starts at the Old Dam (just north of the Erica Garden), which was the Garden’s first irrigation dam, built into Nursery Stream in 1916. A wooden bridge built over the wall of the dam leads to the group of huge old stone pines (Pinus pinea) that were planted here long before the Garden was established. The trail is right underneath Castle Rock and Nursery Buttress and one gets an unusual, ‘distorted’ view of the mountain through the trees. At the top end of the trail, if the right fork in the path is followed, the hiker will come out on the lower contour path and could pick up the Silvertree Trail. Similarly, after crossing Nursery Stream, if the hiker takes the right fork, they will come out on the Fynbos Walk in the Protea Garden. The dominant tree on this trail is Rapanea melanophloeos, the boekenhout, or Cape beech in English. 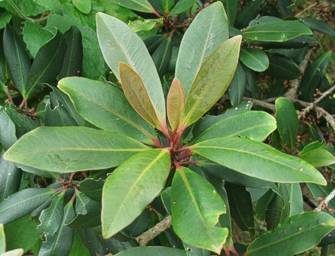 Recognise the Cape beech by its leathery, dark green leaves clustered towards branch ends and reddish stalks. It is a medium to tall tree with smooth grey bark, small greenish flowers in winter and small purple berries in spring-autumn. Its timber is hard and heavy, and similar to that of the European beech (Fagus sylvatica), but the two trees are not closely related. Go to our plant information website to find out more about Rapanea melanophloeos.